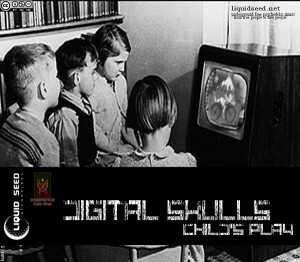 Liquid Seed Recordings and Irrespective Music Minds join forces to present Child’s Play by Digital Skulls. The style is bold and brawny psychedelic trance with a massive sound inspired by life on old monochrome television sets. This music is designed for cathartic moments of chaos in this mad dark world of ours, advising us to stay childlike in our souls and adult in our thoughts and actions. Let’s play music like children and corrupt the false light of the wise adults with our darkness! Mastering and design by Acid Lagos @ Liquid Seed Studio, Greece. MP3 Download | FLAC Download | WAV Download · Download count: 7,544. Yep, unfortunately, the album sounds like I’m watching 1950’s television programming. At least the 60’s were more interesting. Good try, though. Peace! this is very good…quality in leads,instruments,fx’s, but principle the twilight pads…good atmosphere!